Virginia Beach Surf - Many Family Virginia Picture Beaches in SE Virginia! Beaches, East Coast Florida Vacation Beaches, Attractions, Points of Interest & "Reviews"
Our Site Users Vacation Web Pages. Use the Links below to do your own Florida / Oregon / Virginia Beaches Vacation Comments or "Rave, Rant, or "Review" Web Page. The Link to your Web Page will be at the bottom of one of the pages linked to below so that you or whoever you e-mail this or your page link to can view your personal comments and uploaded photo 24/7. The pages linked to below have complete instructions on how to set up Personal Vacation Comments or a "Review" Page. Just type in your Florida / Oregon / Virginia Picture Beaches Vacation Favorites, experiences, and even your Tips! -- upload your favorite Picture file we will do the rest! Check back here in a minutes for your Personal Vacation Web page and your added Picture -- Posted on the Web so you can easily e-mail your friends to look at your "Top Picks" and comments from your Vacation! - 24/7/365. Your personal Florida, Oregon, or Virginia picture beaches page on the web! Fill in and send us the Form on one of the pages below so we can do Your Vacation Page! These are the Pages on this Site where you can now do Oceanfront Vacation Condo Resort, Attraction, or Restaurant "Raves, Rants & Reviews from your Vacation Rental, Exchange, Ownership, or Attraction Visit & Restaurant experiences. - and where you can see Comments & Reviews already done. - The easy to use Site User Review Input Form is toward the bottom of each of the pages listed below. VA Beach Campgrounds & RV Parks User Comments & "Reviews" Page - send us your Virginia Beach Camping User "Raves, Rants, & Reviews"
Samples of User Vacation Comments and "Reviews" that have already been shared by our "regular" Site Viewers. Please also send us any comments on individual Virginia Beach Area Timeshare Beachfront Resorts where you own week(s) or have exchanged to + local Beach attractions you enjoyed. Even good Bed and Breakfast Inns you have stayed at. Attached Photos to go with the comments are always appreciated! Virginia Beach Picture Album - plus some places of interest in the immediate Virginia vacation beach area. -- Includes Newport News, Yorktown and Jamestown - Places of Interest and Attractions within 90 minutes driving time - Great Day Trips! OTHER Virginia Beaches - Other than "the" Virginia Beach - in the local Virginia Beach area. Many scenic and interesting often "hidden" beach areas in and near Virginia Beach! SE Virginia Vacation Beaches - Includes SE Virginia vacation beaches in areas of: Chesapeake Bay, Newport News, Hampton, Cape Charles, Yorktown, Smithfield, and Jamestown. Some great family vacation beaches in the area! Virginia Attraction & Discount Travel Tips for the 50+ Crowd - Includes Car Rental Discounts - "over 50ers" and the "Seasoned Citizen" Set often can get some special discounts we talk about here! Top Pick Books & Guides: Southeast Virginia vacation beach Guides + Attractions Guides. Also Kids Travel Games and Kids Songs Ideas. 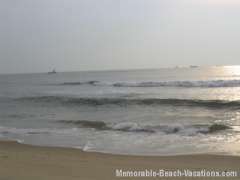 To top of this page - Virginia Picture Beaches - Pg 1 - Our site Users Vacation Web Pages.